The Ancestral Genealogy of our Families. Welcome to Clan MacLellan Ancestry Trees! Clan MacLellan Ancestral Trees is a members only site and is not accessible to the public. All users must be registered with Clan MacLellan and register at this page with the same email address to assure quality control. Please remember the principal rule of a fact, 1 document is a possibility, 2 documents probability and 3 documents makes it a fact. Documentation should be referenced or cited or a saved image or a document. There are several group Trees that will be shared, please do not post living people in these shared Trees. New Clan MacLellan Ancestral Forum, is here! Clan Maclellan Ancestral Forum. Please Login or Register to start your MacLellan Ancestral Tree.While your here, Sign Our Guestbook! 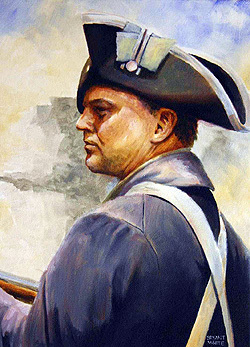 Portrait of Hugh McClellan who participated in the remarkable defeat of Burgoyne's army at Saratoga in 1777. You can find Hugh McClellan in the Michael McClellan of Massachusetts Tree or the Guest Member 4, account. Clan MacLellan Ancestral Trees - created and maintained by Jay Webb Copyright © 2016-2019 All rights reserved.